Tripmate offered travelers a way to book unique local experiences not found using regular tour companies. The website connected travelers to local guides, referred to as mates. It had two sides to its marketplace, one for the travelers and one for the local mates. In the last decade, Panamanian tourism rapidly increased. The MVP provided experiences for people traveling to Panama. 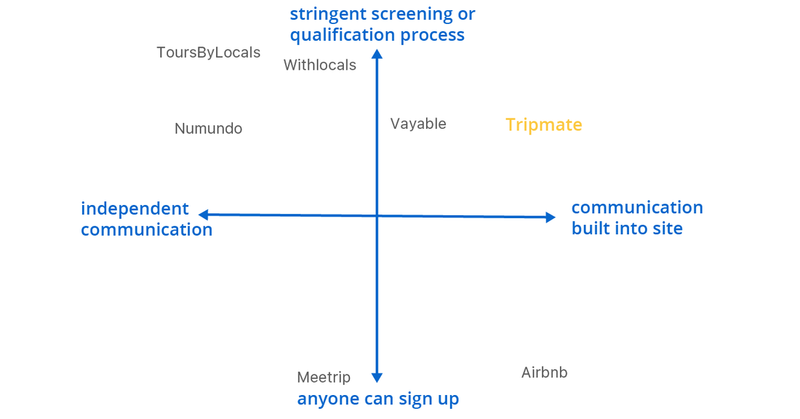 In the future, Tripmate planned to expand throughout Latin America. Our three person UX design team sectioned our work into three sprints. We ended with a completely interactive mid-fidelity Axure prototype that focused on the traveler side of the website. Tripmate's ideal travelers were between 20 and 30 years old. They loved adventure, were self guided, and traveled with one to two other people. Throughout this study, keep in mind the word "trip" is referring to tours and local experiences. Tripmate uses the word tours as trips. We found this caused misunderstandings amongst users and took this into account throughout our design process. We branched our research into four topics. Our domain research consisted of a three prong approach. The Tripmate ideal traveler was an adventurous millennial. I discovered that millennials were the shared economies earliest adaptors. This type of economy valued experiences based around sharing. It was budget friendly and benefited the whole community versus a one sided business benefit. Safety, confirm that Panama was a travel safe country. If it was globally marked unsafe, would it affect tourism? My teammate found that Panama was a safe place to travel. It ranked the second safest destination in Latin American. There were four main categories. ​I noticed parallels with Airbnb and online dating sites. I found interesting patterns in how these companies address building trust and security. I wondered what made people feel safe booking an Airbnb. Why did a traveler trust the host information and? What made them decide to book an Airbnb? This correlated to potential mate and traveler relationships. A traveler needed trust in their mate’s information to book an activity. Thus, we looked at how guides qualify to lead activities. With some sites, anyone could sign up. Others offered a stringent screening and qualification process. deemed knowledgeable, personable, and provided a safe experience. The competitors Numundo and Vayable had a similar process. personal contact information. Like Tripmate, some companies communicated solely within the platform. We overlaid the two competitor scales and saw unfilled space in the market. Companies with similar levels of mate screening did not have on site communication systems. This was an area Tripmate could maintain, build out, and stand out in. ​Our team and a few testers analyzed the website for more research. We saw aspects of the site that worked as well as potential improvement areas. ​We conducted interviews using a two pronged approach. We sought to gain knowledge of the mentality of both tour guides and travelers. This gave us an understanding of both sides of the market. We interviewed two Tripmate guide. They already used Tripmate and provided local experiences. To further understand the tour guide point of view, we interviewed two additional tour guides. Lastly, we spoke to a yoga instructor to get the perspective of someone that guided a group of people. ​We interviewed seven travelers. They were between the ages of 22 to 32. They traveled one to four times per year with one to two other people. ​Using an affinity diagram, we divided our interview findings into categories. We found several common occurrences amongst the guides and the travelers. Guides valued immersing others in local cultures. It was important that they shared their personal knowledge. They also wanted people exposed to to new experiences. ​A tour guide said that seeing people experience something for the first time reminds me how special it is. Pain points amongst guides resulted from issues out of their own control. Guides experienced transportation challenges. They had safety concerns for various activities, e.g. intense hiking, swimming. Sometimes they had weather issues with lack of weather preparation. In addition, guides had concerns when they travelled through dangerous locations within a city. Travelers sought new experiences that weren’t accessible at home, e.g. food, nature, people, cultures, traditions. They wanted opportunities to meet locals. On their trips, it was important that they found a balance of intensity and relaxation. Travelers wanted tours to fit into their budget. A top value amongst the travelers was building trust. This branched into trust online and trust on tours. The pain point for travelers was when a tour didn’t meet their expectations. They felt disappointed when the tour description was misleading. People signed up for tours for certain reasons. If the outcome was not what they expected, it ruined their experience. Travelers felt upset when to guides seemed uninterested in the tour. Some people experienced language barriers and this caused frustrations and limitations. With barriers, travelers missed vital information about weather, tour preparation, and the tour itself. Lastly, people lost confidence when it was hard to get in contact with a guide or company. ​People wanted conversations with their guides before meeting them in person. People gained trust from building a solid starting foundation. We learned this from asking about people’s experiences using Airbnb and online dating. A trustworthy site provided reliable information about the tour and guide. This gave the traveler knowledge about the tour and insight on how to plan and prepare. Travelers built trust on a tour when the guide catered to their needs. They wanted attentive guides that intelligently answered their questions and knew their information. It was important that guides brought the tour to life. Travelers felt comfortable with approachable and friendly guides. This allowed travelers to be themselves without worries. ​A user’s experience on the Tripmate site determined the company's future adoption. It also defined the functionality of the mate side of the site. We designed for the traveler since that determined whether the first users decided to try it. Another outcome was whether they’d recommend it and provide positive reviews. Based on the research we gathered, we created a persona. This persona was an adventurer that traveled with one to two friends and fit into the Tripmate age demographic. Our persona was named Tom. He helped us to further empathize with our users. We needed our design to fulfill his motivations and goals and eliminate his frustrations. I try to find out what locals like to do and then make secure plans. understanding of the problem. This was also based on what we learned from our research methodology. Initially, we considered adding the specified location, Panama. Ultimately, we didn’t think it added or changed anything, so we left it out. We did include the millennial user group. Millennials were the driving force of the shared economy market. As learned through our research, millennials wanted authentic experiences when they traveled. Like Tom, they wanted to diversify their experiences and learn about new cultures. They were most likely to try a new way of approaching travel. We worked to solve this as we built out our designs. The millennial traveler needs to feel confident that the local activities they book meets their expectations, because they want their investments to result in an opportunity that broadens their horizons. We kept Tom in mind and created four main design principles. These guided our work and gave us a baseline to refer to for every design decision. This ensured the problem had a solution. ​Content presented itself in a unified and standard format to assure travelers that they were fully informed about the experiences offered. The website had a unified and coherent presentation and format. It was important for travelers to understand what they were signing up for before they booked. Consistency across the site gave them that confidence. The site encouraged clear, reliable, and open communication between the mates and the travelers. The site incorporated an easy way for the traveler and mates to communicate. This helped travelers build a trustworthy relationship with the mate and build feelings of confidence ​in Tripmate. Users could easily maneuver through the site and make sense of its functionality. What you see is what you get. It was important that the navigation and information on the site was transparent. This way, the travelers found what they looked for, understood tour details, and felt comfortable about the booking process. The site was approachable and invited users to explore and choose a special local experience. We wanted to encourage travelers to explore and feel interested in what the site offered. 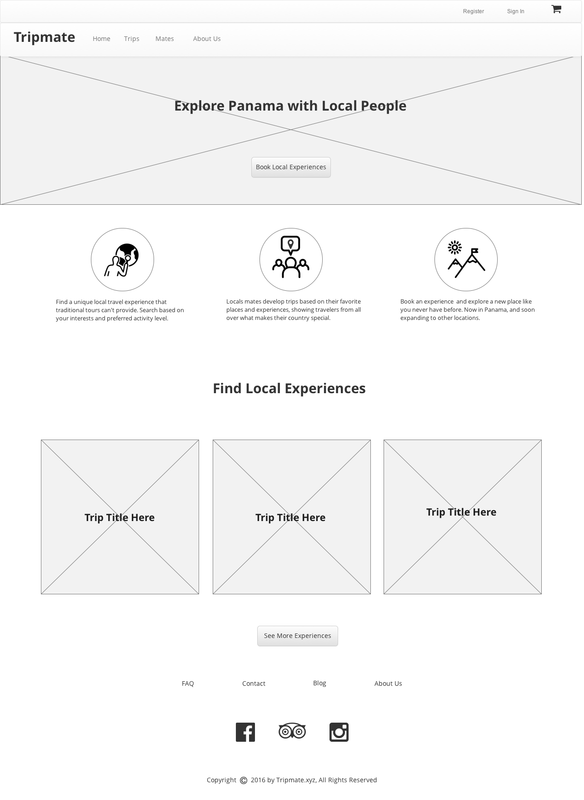 ​We applied positive aspects of the Tripmate site into our low-fidelity designs. We diverged and created three distinct paper prototypes. All prototypes incorporated a home page, a view all the trips, and a trips details page. My teammates created prototypes B and C, and I personally made A. The pages within each prototype correlated to our design principles. To determine if these concepts were comprehensive, we laid out specific tasks per prototype and tested them. We tested six people within Tripmate’s target demographic. The people were millennials and they worked in advertising, marketing, design and logistics. They loved to travel and go on adventures. They were a new user. Their task was to message a mate. This required them to go through the sign in process and create a profile. The user already logged in. Their task was to book a trip and message a mate. To better understand the users experience, we analyzed key takeaways. We broke down the findings per page. This allowed us to compare the prototypes side by side. Our findings revealed areas of improvement across all prototypes. The home pages included a search bars. Users didn't know what to search for. Some thought they were searching for local experiences and others thought flights and hotels. As we moved forward we considered the following. The search function needed clear content to explain its exact purpose. Also, the search bar needed selections versus being an open search. This was crucial because it determined if users understood the site’s intention. Two prototypes used the word “featured trips” to promote upcoming trips. Users thought the featured parts were advertisements. It made them wary of the authenticity of the site. It was important to rethink this word, as we wanted to gain user’s trust. Large call to actions caught user’s attention. This was important because users felt drawn to click it. It led to the page that contained an abundance of trips. The CTA stated to find local trips. There was a disconnect between what the user expected and what the content presented. User’s still thought they would be searching for flights and hotels. 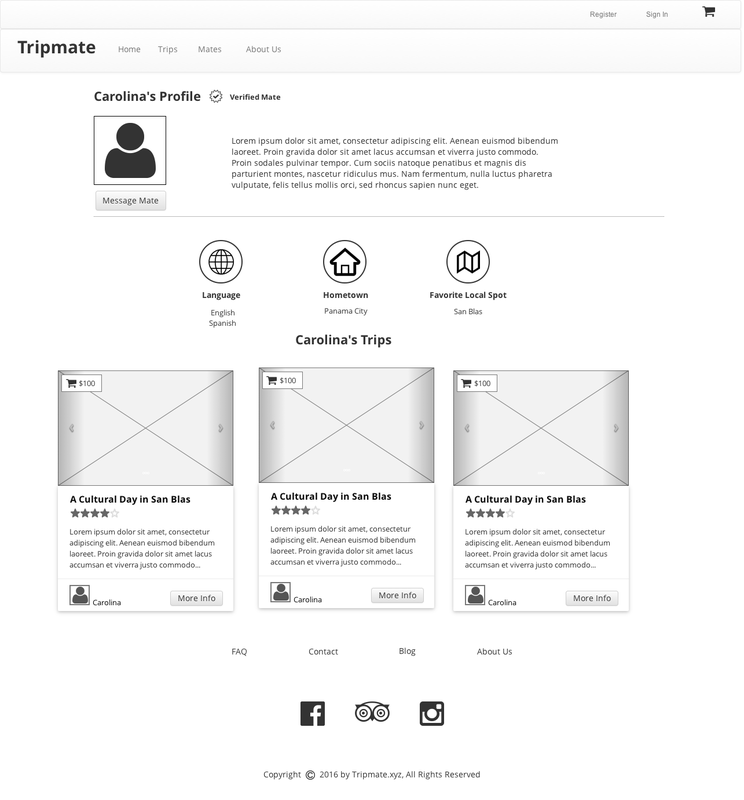 In order for users to know what Tripmate was about, the home page needed more transparent content. Users valued the side bar sorting features in prototypes A and C. This felt familiar and allowed users to organize and customize their search to fulfill their needs. It was important to offer an array of searchable information to cater to the travelers needs. Prototype C’s automated search was more effective than the saving search option in prototype A. Our interviews revealed images gained people’s trust. My prototype offered clickable image carousels per trip. This increased user engagement and interactions. There was a positive response. The preexisting site offered searching by card view and list view. Prototype C offered this option and it responded well. It allowed users to search in their preferred way. The icons with words gave people a nice visual reference to pair with the detailed trip information. Users responded well to this. It allowed users quick access to information and consistency across the platform. Some users valued reviews. Lack of reviews may impact one’s decision to book. Because the site was an MVP, we sought solutions for tours without any reviews. Users liked the questions and answers section in prototype C. It was a source of reliable information. It made the mate seem more approachable and someone a traveler could depend on. The travelers felt comfortable. Prototypes B and C included a booking process. In prototype C, travelers requested a tour time and the mates confirmed the time request. This approach to booking was definitely less popular. Users wanted instant gratification when they book a trip. The registration process needed to be quick, basic, and non-disruptive. Prototype A tested this concept. This was a three step process with pop-ups. First, users clicked on a task. To complete the task, they needed to register. Then they registered, created their profile, and performed the initial task. There were too many steps. This caused users to forget what task made them register in the first place. Moving forward, we sought ideas of the best way for users to stay on track of their task while going through registration process. Prototypes A and B incorporated messaging systems. Users had readability issues when messaging. It was important that the traveler's name and picture was opposite the mate's within a conversation. Users trusted their message went through with confirmation pop-ups. ​The navigational pathway to access messages was clear. There were clear functions on main message page such as delete, compose a new message, and access a particular message. Prototype C offered a my trips page. Users valued a place where they saw everything they booked. The sections needed additional details such as the duration of the trip and the meeting spot. We found general takeaways applicable across all prototypes. It was vital that we created a content strategy that reflected the site’s functionality.The site needed to properly because words easily influenced the decisions of users. The organization of trips and sorting options were valuable and personable. Icons, photos, asking a questions, pop-ups and reviews engaged users. These produced a positive response. We pulled successful pages from each prototype to serve as foundation pages in our final flow. The message system and simple navigation bar from prototype A succeeded. Users properly communicated and navigated around Tripmate with that prototype. The registration process needed rethinking to keep users on track. We used the booking process from prototype B because it was efficient and straightforward. We chose Prototype C as the foundation for home page, all trips page, and trip details page. The flow was consistent and understandable. We also added a mate profile page for further consistency and engagement. We added the positive details and interactions that we collected from our concept tests. For areas of uncertainty, we did card sorting and additional tests. ​Our team unity and collaborative mentality resulted in a successful mid-fidelity prototype. Throughout the process, our design principles played an important role and drove our decisions. We fulfilled the responsibilities of providing a consistent and engaging prototype. The prototype gave users confidence that their trip would meet their expectations. The site offered messaging systems for effective communication, which built trust in the mates. With an understandable site, the users could successfully maneuver and invest in tours. Because users found confusion in the word trip, the content on the homepage needed to properly communicate the sites intention. I prompted creating a three part explanation on the page. I wanted users to instantly understand what the site was about. It proved eye catching and insightful. My teammate and I sought value in different homepage looks. I favored version one and my teammate opted for version two. Thus, we each created two versions. We tested these on six different people. We showed each page one at a time and asked a simple question. What did you think you would do on this site? Version 1 solely incorporated the CTA to book a local experience. It gave people a sense of exploring and learning about Panama. Yet some people didn’t always realize they’d have a chance to book a concrete activity. Some thought they would come to this site to just read and learn about Panama. Version 2 allowed people to enter their travel dates and locations before moving forward. This setup was like traditional travel sites. It let people know right up front that they would be booking something. They knew there was a commitment involved. A lot of people liked being able to start the search process right from the home page. But, people thought those commitments included booking flights or hotels. In the end, we had divided results on which version made more sense. My teammate and I valued the knowledge that we gained from that experience. We went with version 1 in the final prototype because users had more of a sense of exploration. This related to our user persona, Tom, the curious explorer. ​Like the preexisting site, users valued the choice of card and list views. To determine the default view, we tested 11 people. The majority preferred card view, so we made that the default. Card view was well received because it provided instant imagery. Users quickly and easily access more information. We included scrollable photos in both views. This allowed users to further explore. We kept the sort function in the final flow. Based on user responses and standard behaviors across other websites we used an auto-updating sidebar filter function. As filters changed, the displayed cards did as well. We included a reset button so that users could go back to the default setting at their preference. ​We included all the information a traveler needed about a trip. Users felt comfortable by having detailed information. The icons and ask a question section engaged users. A flushed out details section further elaborated the information pertaining to the icon categories. This section included addition topics such as transportation information and weather as well. Since some tours had reviews and others did not, we kept the reviews in the sidebar for consistency. For new trips without reviews, we included a button notifying users to add the first review. For existing trips, we added a more reviews button intended to open a modal or reviews page. ​It was important to have well thought out icons to align with user values. To determine top icons, we used a card sorting method. We tested six people in our user demographic. We presented them with a scenario. Choose the top three categories you definitely want to have and see information about for the tour. ​Each person sorted the categories into the three options. Afterwards, we tallied which the top three categories and so on. ​We explored two different approaches to messaging. Similarly, my teammate and I had different views. One option allowed conversations between two people to take place in one continuous thread. This was like a text message, Facebook message thread, or the current setup on Airbnb. I favored the other option. It allowed users to start new conversations. The messages centered around an individual tour. This was like traditional email or messaging system on shopping sites like Etsy. Despite our conflicting opinions, our passion and drive was congruent. We developed a detailed pros and cons list and decided to go with the second option. Having a flexible messaging system allowed users to have separate conversations about different topics. Some mates offered multiple tours. If user had questions about more than one tour, this allowed for additional specifications. This mate profile page added to our design principles, consistent and communicative. It followed a structure familiar to the individual trip pages. We utilized icons and word pairings. These icon/words represented the mate’s languages, hometown and lastly their favorite local spot. There was also mate verification credentials to acknowledge the screening process. It was communicative and made the mate appear credible, relatable, and real. A few small changes completed the booking process page. We moved the payment button to the bottom because it made the flow more congruent. Previously, it was on the side of the payment form and users had a hard time finding it. We added more details to the order summary so that users felt confident. This way, they saw right there on the page the date and time of the trip while they paid. The registration included a pop-up which highlighted the advantages one gets when signing up. Post the sign up, another pop-up appeared to clearly define what users had access to. ​As Tripmate developed further, we offered future considerations. Overall, this experience was possible through our impeccable communication and teamwork. We challenged each other's ideas with the intention to find the best solutions possible. We fused our knowledge and developed a flushed out UX prototype for the traveler side of Tripmate. The Axure prototype considered trip pages where there weren’t reviews yet. We suggested incorporating content that said that it was a new trip, add a review. Once there were more reviews we suggested changing the location to highlight reviews. Another idea was to include reviews from the mates and travelers on TripAdvisor. Users trusted in TripAdvisor and already engaged in that site. ​Because of the inconclusive home page results, we suggested future testing. It was important to test additional people to see how they responded to the different options.The intention of these tests was to ensure that Tripmate's purpose was clearly understood. The current site focused on Panama so we presented expansion ideas for the home page. We discussed implementing new home page taglines and new ways of searching. During our paper prototype testing, prototype C included a notification bell in the upper right corner of the navigation bar. It gave users a visual alert that they had a message. Although we did not flush this feature out in Axure, we recommended using it in the future. For the questions and answers section, we thought about the process when a mate answers a question. Perhaps users could have an auto message or receive an alert.